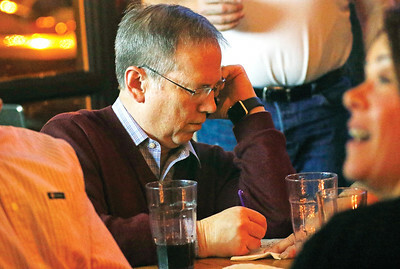 H. Rick Bamman - hbamman@shawmedia.com McHenry County Board Chairman Joe Gottemoller talks on a phone while taking notes on early results at Giorgio's in Crystal Lake on Tuesday, March 15, 2016. With all of the county's 212 precincts reporting, challenger Michael Walkup held a 1,400 vote lead over incumbent Gottemoller for the Republican nomination for the office. Walkup, a County Board member like Gottemoller, had 23,646 votes to 22,241 for Gottemoller, or 51.5 percent to 48.5 percent. Polls in McHenry County stayed open until 8:30 p.m. Tuesday after problems with the electronic poll books in several precincts caused delays for some voters. 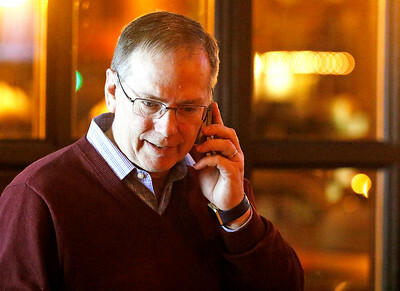 H. Rick Bamman - hbamman@shawmedia.com McHenry County Board Chairman Joe Gottemoller takes a call with early results at Giorgio's in Crystal Lake on Tuesday, March 15, 2016. 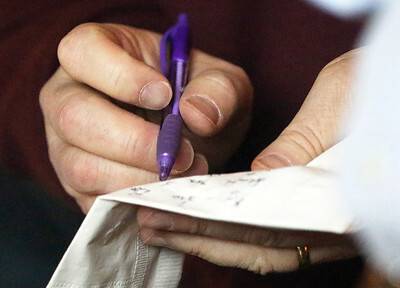 H. Rick Bamman - hbamman@shawmedia.com McHenry County Board Chairman Joe Gottemoller checks early results written on a napkin while witing for more returns Giorgio's in Crystal Lake on Tuesday, March 15, 2016. 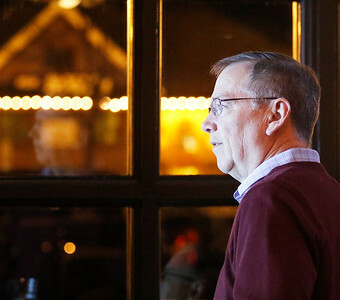 H. Rick Bamman - hbamman@shawmedia.com McHenry County Board Chairman Joe Gottemoller watches as results are projected onto a screen Tuesday, March 15, 2016 during an elction night party at Giorgio's in Crystal Lake. 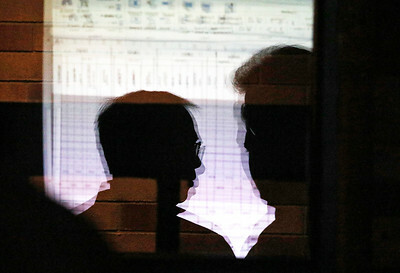 H. Rick Bamman - hbamman@shawmedia.com McHenry County Board Chairman Joe Gottemoller (left) is silhouetted and reflected with election results in a window at Giorgio's in Crystal Lake on Tuesday, March 15, 2016. 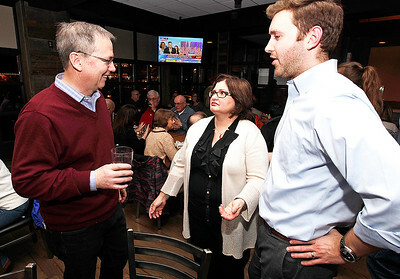 H. Rick Bamman - hbamman@shawmedia.com McHenry County Board Chairman Joe Gottemoller, waits with his wife Chris and son Alex for early election results at Giorgio's in Crystal Lake on Tuesday, March 15, 2016. Polls in McHenry County stayed open until 8:30 p.m. Tuesday after problems with the electronic poll books in several precincts caused delays for some voters. McHenry County Clerk Mary McClellan said the problems were sprinkled throughout the county, with problems being reported at select locations in Algonquin, Chemung, Dorr, Dunham, Grafton, McHenry and Nunda townships. 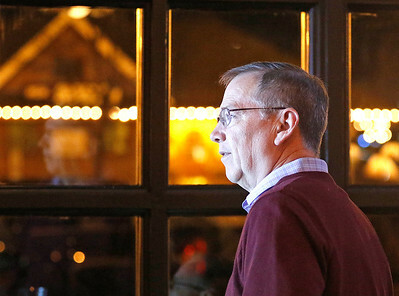 McHenry County Board Chairman Joe Gottemoller talks on a phone while taking notes on early results at Giorgio's in Crystal Lake on Tuesday, March 15, 2016. With all of the county's 212 precincts reporting, challenger Michael Walkup held a 1,400 vote lead over incumbent Gottemoller for the Republican nomination for the office. Walkup, a County Board member like Gottemoller, had 23,646 votes to 22,241 for Gottemoller, or 51.5 percent to 48.5 percent. Polls in McHenry County stayed open until 8:30 p.m. Tuesday after problems with the electronic poll books in several precincts caused delays for some voters.